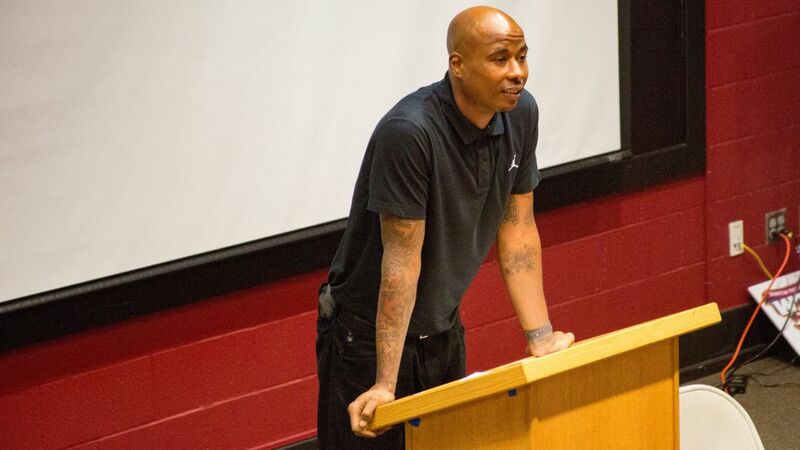 TALLAHASSEE, Fla. – Quentin Richardson, a 13-year veteran of the NBA and current professional scout with the Detroit Pistons, delivered a message of humility and personal financial accountability in an hour-long talk with more than 100 members of the REAL Men program sponsored by the Florida State Athletics Student Services Office. The REAL (Reliable Educated Approachable Leaders) Men program provides an opportunity for male student-athletes at Florida State to further develop their leadership and personal development skills. Among the many topics addressed each semester in these workshops are effective communication skills, values and ethics, conflict resolution, goal setting, time management and branding. 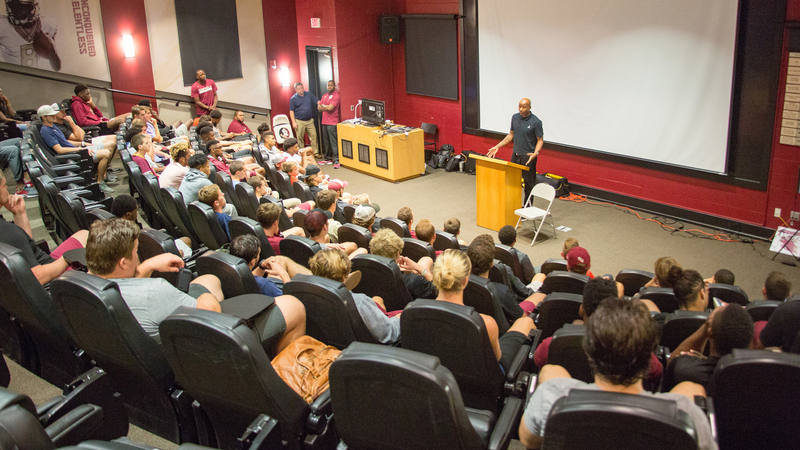 Richardson was invited to speak at Florida State as part of a four-night series during the fall 2017 semester. Also scheduled to speak to the group are Corey Simon (a member of the Seminoles’ 1999 national championship football team and eight-year NFL standout), Shamaree Brown (Director of Student-Athlete Programs and Compliance at the Atlantic Coast Conference) and Tyler Holt (a member of the Seminoles’ 2010 College World Series team and two-year MLB star). In a single eight-month stretch when he was 12-years old, he watched as his brother, Bernard, was shot and killed on the south side of Chicago. A few months later, he lost his grandmother to natural causes then watched as his mom suffered and eventually succumbed to breast cancer. From that point forward, Richardson said, he recognized God had much bigger plans for him. “I still feel to this day that if I hadn’t gone through the things I did at 12-years old, I wouldn’t be here today. I don’t think I would have made the NBA. I don’t think I would have had the fight; I don’t think I would have had the toughness; I don’t think I would have had the drive or the strength to do it. Richardson then implored the student-athletes in attendance to take advantage of all of the programs available to them, including REAL Men, during their careers at Florida State. “When I was in college (at DePaul University) we didn’t have anybody speak to us like this,” said Richardson. “To just focus on your sport is difficult. Look at all of the distractions you’ve got –the company you keep can take you out of it before you have a chance. You can have friends, a people who hang around you, who can really mess it up for you. Because of the outside distractions, he asked those in attendance to be careful with whom they associate and give access to their valuables. Using himself as an example, he told of the need to be financially responsible. “You get all of this money and you think you are rich,” said Richardson. “You think you have it all; you think you’ll be in the league for a long time. The average career in the NBA is four years. That’s the average. That’s nothing. You’ve got to use your financial people, listen to them and be really smart. Richardson’s words and stories captivated the student-athletes, including sophomore basketball player CJ Walker. Derrick Coles, Director of Student Athlete Development and Community Service at Florida State, certainly agreed with Walker.